Barcelona have backed Lionel Messi in his tax fraud case and will fight "the external decisions" they claim are unfairly targeting the club. On Thursday, a Spanish court ruled that the striker and his father should stand trial on tax fraud charges. Barcelona say this stance is "the complete opposite" to that of the public prosecutor, who says the charges against Messi, 28, should be dropped. Two other current Barca players have been targeted by Spanish authorities. "FC Barcelona condemns the accumulation of totally inadmissible and external decisions that have been going on for some time and that have nothing to with strictly sporting affairs," Barcelona said in a statement. "They are damaging to the smooth running of the club, its stability and that of the players that form part of it. "The club shall be working with more determination than ever to defend its legitimate rights and is ready for any new challenges that might arise." In September, Argentina international Javier Mascherano was charged with two counts of defrauding the Spanish tax authorities of a total of more than 1.5m euros (£1.1m), while Brazilian Neymar was formally accused by a judge of evading 14.1m euros (£10.4m) in taxes. The club itself was charged last year with tax fraud in the signing of Neymar from Brazilian club Santos and paid 13.5m euros (£11.2m) in what it called a "complementary tax declaration". 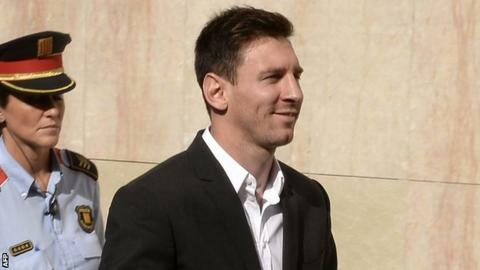 Messi and his father Jorge are accused of defrauding Spain of more than 4m euros (£3.1m) and lawyers acting on behalf of the tax authorities have demanded 22-month jail sentences for both defendants. They both deny any wrongdoing. Barca's statement added: "FC Barcelona has expressed its affection and solidarity to Leo Messi and his family in such a peculiar situation. "The club shall continue to offer him and his family its full support and assistance in the legal, fiscal and administrative aspects of these proceedings." Messi's lawyers have argued that the player had "never devoted a minute of his life to reading, studying or analysing" the contracts, El Pais newspaper have reported.